Based on the anatomy of our fossil forebears, Wrangham thinks that Homo erectus had mastered cooking with fire by 1.8 million years ago. Critics have countered that he lacks evidence to support the claim that cooking enhances digestibility and that the oldest known traces of fire are nowhere near as old as his hypothesis predicts. New findings, Wrangham says, lend support to his ideas. 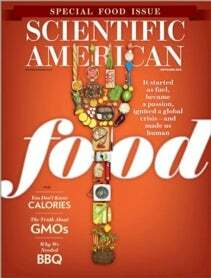 Scientific American: How did you come up with the cooking hypothesis? Wrangham: I think of two strands. One is that I was trying to figure out what was responsible for the evolution of the human body form, and I was sensitive to the fact that humans everywhere use fire. I started thinking about how long ago you would have to go back before humans did not use fire. And that suggested to me the hypothesis that they always used it because they would not have survived without it. Humans as a genus [Homo] are committed to sleeping on the ground. I do not want to sleep on the ground in Africa without fire to keep the wild animals at bay. The other strand is that I've studied chimpanzees and their feeding behavior for many years. I've eaten everything that I can get ahold of that chimpanzees eat. And I have been very much aware of the deeply unsatisfying nature of those foods because they are often quite fibrous, relatively dry, and contain little sugar, and they are often strong-tasting—in other words, really nasty. So here we are, two very closely related species with completely different dietary habits. It was an obvious hypothesis that cooking does something special for the food we find in nature. But I was astonished to discover that there was no systematic evidence showing what cooking does to the net energetic gain that we get from our foods. For the past 14 years I've been focused on that question because to make a satisfactory claim about humans being adapted to cooked food, we have to produce some real evidence about what cooking does to food. Experiments conducted by Rachel N. Carmody of Harvard University have now given us the evidence: if we cook, we get more energy from our food. Other researchers hold that increased access to meat allowed the teeth and gut to shrink. Why do you think cooking better explains these changes? It's quite clear that humans began eating meat from large animals by 2.5 million years ago and have left a steady record of cut marks on bones since then. The cooking hypothesis does not deny the importance of meat eating. But there is a core difficulty with attributing changes in digestive anatomy to this shift. Selection pressure on digestive anatomy is strongest when food is scarce. Under such conditions, animals have very little fat on them, and fat-poor meat is a very poor food because if you have more than about 30 percent protein in your diet, then your ability to get rid of ammonia fast enough is overwhelmed. Nowadays in surveys of hunters and gatherers, what you find is that during periods of food scarcity, there is always a substantial inclusion of plants. Very often it's tubers. To eat those raw, you would have to have the digestive apparatus to handle tough, fibrous, low-carbohydrate plant foods—that is, large teeth and a big gut. So your idea is that by cooking those plant foods, our ancestors could evolve a smaller gut and teeth—and avoid overdosing on lean meat. Let's turn now to what happened when food was not so scarce and animals were good to eat. You have argued that cooking may have helped early humans eat more meat by freeing them up to hunt. What is your logic? A primate the size of an early human would be expected to spend about half of its day chewing, as chimpanzees do. Modern humans spend less than an hour a day, whether you're American or living in various subsistence societies around the world. So you've got four or five hours a day freed by the fact that you're eating relatively soft food. In hunter-gatherer life, men tend to spend this time hunting. That observation raises the question of how much hunting was possible until our ancestors were able to reduce the amount of time they chewed. Chimpanzees like to eat meat, but their average hunt is just 20 minutes, after which they go back to eating fruit. Hunting is risky. If you fail, then you need to be able to eat your ordinary food. If you hunt too long without success, you won't have enough time to process your usual, lower-quality fare. It seems to me that it was only after cooking enabled individuals to save time on chewing that they could increase the amount of time spent on an activity that, for all its potential benefits, might not yield any food. You have also suggested that cooking allowed the brain to expand. How would cooking do that? With regard to the brain, fossils indicate a fairly steady increase in cranial capacity, starting shortly before two million years ago. There are lots of ideas about why selection favored larger brains, but the question of how our ancestors could afford them has been a puzzle. The problem is that brains use a disproportionate amount of energy and can never be turned off. I have extended the idea put forward by Leslie C. Aiello, now at the Wenner-Gren Foundation in New York City, and Peter Wheeler of Liverpool John Moores University in England that after cooking became obligatory, the increase in food quality contributed to reduced gut size. Their newly small guts were energetically cheaper, allowing calories to be diverted to the brain. In 2012 Karina Fonseca-Azevedo and Suzana Herculano-Houzel of the Federal University of Rio de Janeiro added a new wrinkle. Their calculations showed that on a raw diet, the number of calories needed to support a human-sized brain would require too many hours eating every day. They argued that cooking allowed our ancestors the extra energy needed to support more neurons, allowing the increase in brain size. Cooking is not the only way to make food easier to digest. How does it compare with other methods? Simply reducing the size of food particles and the structural integrity of food—through pounding, for example—makes it easier to digest. Carmody did a study that looked at tubers and meat as representative types of food that hunter-gatherers eat and asked how well mice fared when eating each of these foods, either raw versus cooked or whole versus pounded. She very carefully controlled the amount of food that the mice received, along with the amount of energy they expended moving around, and assessed their net energetic gain through looking at body-mass changes. She found that pounding had relatively little effect, whereas cooking led to significant increases in body weight whether the food was tubers or meat. Is there any genetic evidence to support the cooking hypothesis? There is essentially nothing published yet. But we're very aware that a really interesting question is going to be whether or not we can detect, in the human genome, evidence of selection for genes related to utilizing cooked food. They might be concerned with metabolism. They might be concerned with the immune system. They might be concerned somehow with responses to Maillard compounds, which are somewhat dangerous compounds produced by cooking. This is going to be a very exciting area in the future. A central objection to the cooking hypothesis has been that there is no archaeological evidence of controlled fire as far back as the hypothesis predicts. Currently the oldest traces come from one-million-year-old deposits in Wonderwerk Cave in South Africa. But you have recently identified an independent line of evidence that humans tamed fire earlier than the archaeological record suggests. How does that work support your thinking? Chimpanzees love honey, yet they eat very little of it because they get chased away by bees. African hunters and gatherers, in contrast, eat somewhere between 100 and 1,000 times as much honey as chimpanzees do because they use fire. Smoke interferes with the olfactory system of the bees, and under those conditions, the bees do not attack. The question is: How long have humans been using smoke to get honey? That's where the honeyguide comes in. The greater honeyguide is an African species of bird that is adapted to guiding humans to honey. The bird is attracted to human activity—sounds of chopping, whistling, shouting, banging and, nowadays, motor vehicles. On finding people, the bird starts fluttering in front of them and then leads them off with a special call and waits for them to follow. Honeyguides can lead humans a kilometer or more to a tree that has honey in it. The human then uses smoke to disarm the bees and opens the hive up with an ax to extract the honey inside. The bird gains access to the hive's wax, which it eats. It used to be thought that the bird's guiding behavior [which is innate, not learned] originated in partnership with the honey badger and that humans moved in on this arrangement later. But in the past 30 years it has become very clear that honey badgers are rarely, if ever, led to honey by honeyguides. If there's no living species other than humans that has this symbiotic relationship with the bird, could there have been some extinct species of something that favored the honeyguide showing this behavior? Well, obviously, the most reasonable candidates are the extinct ancestors of humans. The argument points very strongly to our ancestors having used fire long enough for natural selection to enable this relationship to develop. Claire Spottiswoode of the University of Cambridge discovered that there are two kinds of greater honeyguide females: those that lay their eggs in ground nests and those that lay in tree nests. Then she found that the two types of behavior are associated with different lineages of mitochondrial DNA [DNA that is found in the energy-producing components of cells and passed down from mother to offspring]. Based on a fairly conservative assessment of the rate of mutation, Spottiswoode and her colleagues determined that the two lineages had been separated for about three million years, [providing a minimum estimate for the age of the greater honeyguide species]. That doesn't necessarily mean that the guiding habit, which depends on humans using fire, is that old—it could be more recent—but at least it tells you that the species is old enough to allow for much evolutionary change. If cooking was a driving force in human evolution, does this conclusion have implications for how people should eat today? It does remind us that eating raw food is a very different proposition from eating cooked food. Because we don't think about the consequences of processing our food, we are getting a misunderstanding of the net energy gain from eating. One of the ways in which this can be quite serious is if people who are dedicated to a raw-food diet don't understand the consequences for their children. If you just say, “Well, animals eat their food raw, and humans are animals, then it should be fine for us to eat our food raw,” and you bring your children up this way, you're putting them at very severe risk. We are a different species from every other. It's fine to eat raw food if you want to lose weight. But if you want to gain weight, as with a child or an adult who's too thin, then you don't want to eat a raw diet. Energetic Consequences of Thermal and Nonthermal Food Processing. Rachel N. Carmody et al. in Proceedings of the National Academy of Sciences USA, Vol. 108, No. 48, pages 19199–19203; November 29, 2011. Honey and Fire in Human Evolution. Richard Wrangham in Casting the Net Wide: Papers in Honor of Glynn Isaac and His Approach to Human Origins Research. Edited by Jeanne Sept and David Pilbeam. Oxbow Books, 2012. Metabolic Constraint Imposes Tradeoff between Body Size and Number of Brain Neurons in Human Evolution. Karina Fonseca-Azevedo and Suzana Herculano-Houzel in Proceedings of the National Academy of Sciences USA, Vol. 109, No. 45, pages 18,571–18,576; November 6, 2012. Kate Wong is a senior editor at Scientific American.